After Big Buddha these famous rocks are probably the most photographed attraction on Koh Samui. I guess that's because no matter how grown up we think we are, naturally shaped objects that appear to resemble certain body parts still makes us giggle. 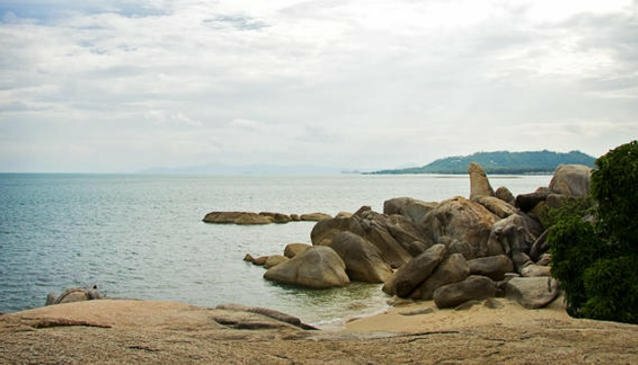 There's really no guessing needed when it comes to Hin Ta & Hin Ya, 2 large rocks shaped like male and female genitalia. Admittedly it is kind of strange that over thousands of years nature has managed to accurately sculpt these 2 complimentary art pieces in the same vicinity. As far as Thai folklore goes, an old couple where washed ashore after their boat sank in a storm, the 2 rocks are the old couple, hence Grandfather & Grandmother Rock. Around this famous site are some great little bars and restaurants, there are lots of market stalls with various souvenirs. You'll find plenty of Grandfather Rocks in all sizes and forms. Hin Ta & Hin Yai can be found at the southern end of Lamai Beach, there's a big sign above the entrance road. It can get pretty busy in high season, and there is not a great deal of parking on a very tight little road. If you do manage to get your bike or car down there it will cost 20 and 40 baht respectively to park, the site itself is free.